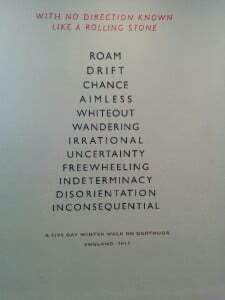 Exploring his connection to place, Richard Long’s latest exhibition is based upon a series of walks that either ended or began in Bristol. 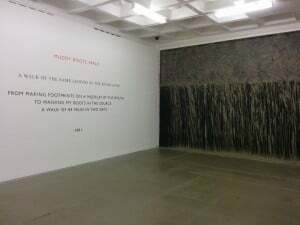 In Gallery 1, on the ground floor at the Arnolfini, splattered against the vast back wall is a piece entitled ‘Muddy Water Falls’, 2015. 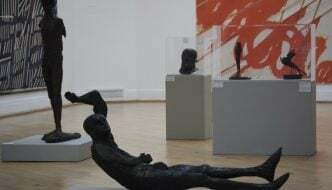 Starkly contrasted with the crisp, white walls on either side of it, I stand facing the artwork, which is composed of mud from the bank of the River Avon, crudely smeared, by hand, directly onto the gallery wall. ‘Muddy Water Falls’ is, therefore, a temporary piece, that Long created in this very space. I imagine that it was a messily therapeutic process, evidenced by the title (muddy water falls, rather than a muddy waterfall), but I do not yet feel that I understand the work. The adjacent walls, whilst clean in contrast, are not devoid of art. ‘Text works’, which are literary-based pieces that float somewhere between visual poetry, haiku, list-making, and journal entries, are neatly affixed to the walls. 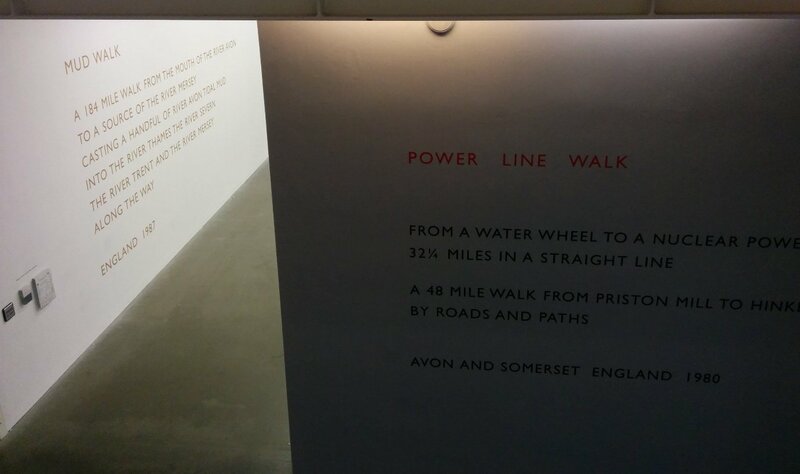 There are text works throughout the exhibition, in the hallways and up the stairs, which evoke Long’s walking tours throughout the years. As I walk the gallery lengths, I get a miniscule notion of the great breadth of the artist’s travels. The variety of his experience is echoed in the multifarious media through which his walks are depicted. Upstairs, Galleries 2, 3, and 4 have been opened up to make one huge, fluid space. Dominating the floor-space in Gallery 2 is ‘Bristol 1967/2015’ – a series of white concentric circles. I am pleased to see a gallery attendant casually stepping over the curved lines, in part because it enforces the idea of Long’s audiences’ experience of his work reflecting the activity from which they are inspired, and, in admittedly larger part, because it means that I can walk through it too. As I metaphorically trace Long’s footsteps, I feel more connected to the work; by being involved I am encouraged to contemplate the artist’s intentions, and my response to it. most appealing work (in my opinion): his photography. 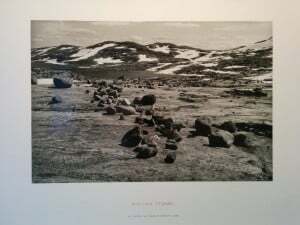 Contrasting the long strings of text that fail to convey the entirety of his walks, his photography demonstrates the extent of his travels, with a quiet, subtle depth. Seemingly placed at random throughout the rooms, I took pleasure in linking text work, to photography, to sculpture. Alone, each piece felt fragmentary – incomplete reflections on whichever walk it pertained to – but, in piecing the art together, I was able to form a more solid understanding of the walks…but still not a comprehension of his purpose. Whilst some concepts were suggested and the exhibition was interesting to experience, visitor reviews left in the Reading Room were mixed. I still haven’t made my mind up either way. The exhbition runs until the 15th of Novemeber at the Arnolfini, so there’s still time to visit ‘Time and Space’, and to come to your own conclusions. 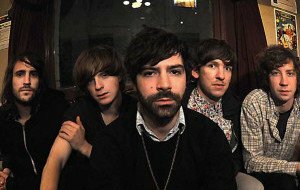 Follow Hannah Emadian on aseparateworld.tumblr.com.